In 2014, 93% of NZEI members voted no confidence in the Ministry's Investing in Educational Success (IES) initiative, and we asked for genuine discussion with educators. We asked for flexible, locally-driven ways to support collaboration. We asked for resourcing to support kids and their learning, not just for new roles. We rejected top-down, one-size fits all models and said we should build off existing successful practice. We voted against National Standards being the determinant of resourcing or roles. We asked for evidence-based approaches. And we came up with a better plan—one that was detailed and costed out—for the Government's planned $359 million of funding. Both the union and the Ministry agreed that it's in the best interests of students and the education system to recognise our differences, but to make progress where there is agreement—in particular, keeping students at the centre of teaching and learning, supporting successful collaboration and transitions and developing improved career pathways. In 2014, the Government planned to spend $359 million on a highly-paid cadre of managers to oversee groups of schools. But parents and educators had a better plan to make a real difference to our children. A phased in programme of improved teacher:student ratios, starting with years 4-8, was estimated to cost from $50 million a year. The Government dropped the target of 100 percent qualified and registered ECE teachers and associated funding in 2010. ECE services are currently only required to have 50% of teachers qualified and registered. Restoring funding for 100% qualified and registered ECE teachers was estimated to cost $32 million a year. In 2014, around 3% of school learners (30,000 children) had high special education needs, but ORS funding is rationed to 1%. Increasing the ORS fund to 3% was estimated to cost $180 million a year to support 20,000 more kids. Teacher aides and other school support staff are funded through schools' operations grants, which means they have insecure work and low wages. Sustainable funding is needed to ensure there are enough teachers aides to support children with learning needs and enough administrative support so teachers can focus on teaching and learning. Children who can access their own culture and language do better at school. But bilingual and rumaki units in schools are under pressure because of the limited numbers of teachers with language fluency. We need more resources for recruitment, training and retention of teachers of te reo Māori and for bilingual education for Pasifika students. For more detail, download the Better Plan document. the possible resourcing and career pathways required to support this. The initiative is comprehensive, looking at what resourcing and roles are needed throughout early childhood education, primary, support staff and special education. Today, with a new government, the work we did together is even more relevant. NZEI leaders in the Joint Initiative group continue to advocate for children and their learning. Working parties were established to look at collaboration, transition and success for Maori and Pasifika learners. These working parties looked for examples of successful practice throughout New Zealand. 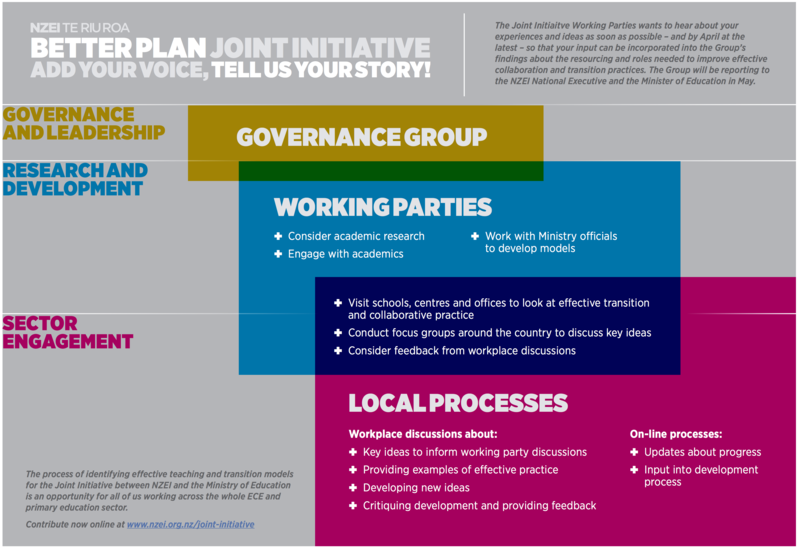 The Joint Initiative working party made visits around the country, meeting with researchers and processing 1300 survey responses from NZEI members. See more about what we learned.